Altus helps you identify and shape your lifestyle and financial goals. We design individual advice to create, manage and protect the financial future that you have pictured. Whether you are looking to set up your own SMSF, want to know where to invest, require financial planning advice, need access to technology to manage your affairs or wonder about the adequacy of your retirement or investment nest egg, we provide a flexible range of solutions designed to meet your needs and your unique situation. There are many elements that are taken into account to achieve your financial plan: your attitude towards risk, your time horizon, investment choice, cash flow and borrowing capacity. For many investors paperwork and multiple platform accounts can be overwhelming. It often makes it difficult to see the bigger picture. How do you know where you are going when you can’t see where you are? Whether you are invested in managed funds, direct shares, term deposits, direct property or other investments, you can see your entire big picture and transact too. INVESTORS seeking a modern financial solution. 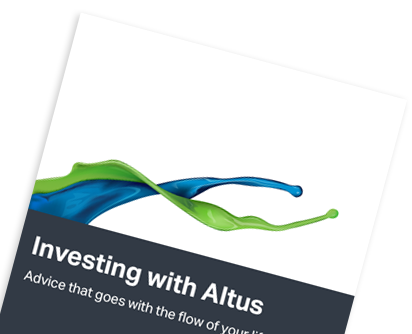 FACILITATE the delivery of timely advice and dialogue with your Altus Adviser. Our investment specialists can create an investment solution that delivers you the financial outcome you’re looking for, whilst ensuring your tolerance for risk is appropriately managed. Investments can be short, medium or long term and we work with you to ensure the time horizon of your investments is aligned with your liquidity requirements and financial goals. When it comes to paying for your child’s schooling, it’s best to start planning as soon as you can. We can help you lay the foundation for your children’s future using tax effective education funding strategies. You can even start before your child is born! For busy executives, investors and family groups we provide an end to end service to take care of your whole financial world. From high end strategy, implementation, accounting and paying the bills right down to acting as your private mail box these solutions can be tailored just for your needs. As part of your overall investment strategy we may recommend utilising our Model Portfolio Series. Our Model Portfolios include a number of investments that blend together to formulate your investment strategy, which is in line with your tolerance to risk. Your investment selection is ready-made by experts in their field. Your portfolio is diversified – your nest egg is not all in the one basket. Changes to your investments over time are subject to our disciplined rebalancing process. This may not initially seem important to you but it is a huge benefit. Our quarterly rebalancing process means that all asset allocations are automatically adjusted regularly according to your planned risk tolerance level. Your financial world is now structured and investment decisions aren’t made ad hoc or based on emotion. The core strategy is the Altus Model Portfolio, which is rebalanced quarterly. The Altus Model Portfolio provides exposure to asset classes that are broadly representative of the market. Satellite strategies then added in addition to the core strategy, providing the potential to deliver higher returns at your risk tolerance. This strategy is not for everyone. It may be better suited to more experienced investors who wish to segment their portfolios, and/or have a higher tolerance to risk, and/or a have a higher net worth. When designing your financial plan its always necessary to ensure that your cashflow is appropriate for your ongoing requirements. Its all part of the mix. Investment, debt, investment returns, your free cash flow and taxation situation need to work in harmony to produce your optimal result. Before you start a SMSF, it’s important to weigh up the benefits and requirements. A SMSF gives you more control over your superannuation and retirement planning, better tax management, improved cash flow management, direct investment risk management, however there is also running costs to consider, the responsibilities are significant and there can be penalties for non-compliance with the rules. For anyone who has reached their preservation age and is still working, there is now the ability to ease into retirement. Until recently, you could only access superannuation benefits if a ‘condition of release’ was met (i.e. turning 65, or retiring after attaining preservation age). This generally made it hard to reduce your working hours and maintain your standard of living. The introduction of a new ‘condition of release’ means it is possible for you to utilise some or all of your superannuation before you fully retire. You can make up for your reduced employment income with a regular income stream from your superannuation benefits. Altus Financial is the nominated adviser on a number of Employer Corporate Superannuation Funds across both metropolitan and regional areas. It is our goal to assist both employers and employees garner the most out of the superannuation arrangement as possible. We assist employees of our partner companies with increasing their engagement with their individual super accounts via structured education programmes and one on one sessions. The information we provide is general in nature with the hope that members will have sufficient knowledge to make proactive decisions about their future retirement savings. An important part of our engagement is the Chairing of Policy Committees which ensures continued improvements to benefits and features for all members. “It’s taken a few days to digest the outcome that you have all worked so hard to provide us with. To say that we will be forever grateful is an understatement. The reason we asked for Altus’s financial assistance was due to the fact that he was highly recommended amongst our friends. From the very first meeting with Rod and his team, we knew that we had made the right decision to entrust our financial well being with Altus Financial. The professional and friendly manner in which each meeting was held made us feel extremely comfortable with the process. Whilst changing our insurances, it was Rod's attention to detail which identified a possible claim with our previous trauma cover policy. The sensitive nature of the issue was handled with the upmost care and discretion. I cannot speak highly enough of the Altus team, specifically Sam Byrne who handled the case. His excellent communication skills kept us informed every step of the way. Through numerous emails and phone calls, Sam made sure that we were fully aware of where the case was at and followed up any questions we had in an efficient and professional manner. This level of communication was invaluable.